Thanks for the update. The only issue I’ve observed is the grayed out Photoshop options, and that only happened when a Windows update was pending. Now no problem. Interesting. So maybe this is a Windows issue and not an Adobe issue. I’ve not heard that line of thought yet, but at this point anything is possible, I guess. Thanks for this very helpful memo Tony. I agree that Photoshop CC 2019 is buggy, but the TKActions V6 panel seems to be fine on my Windows computer and laptop. My main problem was that I could not open an image in PS from Bridge. The quick fix that the Adobe Tech person had me try didn’t work so I had to let him take over control of my computer and do a rather long and complex fix. It was fascinating to watch! I wish Adobe didn’t find it necessary to do a major update every year; I’d rather they just fix bugs and leave us alone to work on our images!! I appreciate the effort you put in to provide support for the V6 Panel. Glad everything is working well for you, Shirley. I’m not sure that problem I mentioned in the blog applies to Bridge, though. I use Bridge too and for me it seems to be working fine. From what I’m reading, the issue I refer to is just when LR opens PS. Although there might be a Bridge issues too. I’ll keep reading the forums to see if anything pops up. It does seem that each new version of PS comes with a new set of bugs. It’s unfortunate, but part of the reality, I suppose, when working on suite as sprawling as Adobe. Adobe is obviously aware of this current problem and I’m sure they’ll get it fixed since it is somewhat major, I think. Yes, Mac seems to have gotten off easy this time, but that’s not always been the case. Most of the problems in the past have been Mac-related. I’ve actually coded several workarounds into the panel itself due to Mac bugs that Adobe hasn’t patched. I’m at least hopeful that this Windows bug will get fixed. Photoshop 2019 seems to freeze up on my DeskTop when I walk away from it for 10 or 15 minutes. I don’t think it has anything to do with Adobe or TK6. I do not have this problem on my Laptop? Other than that, everything in TK6 works well. Sure would like see some tutorials on B&W conversions? This freezing issue is being discussed on this Adobe thread. Thanks for the update, I too have noticed PS 2019 is quite buggy. I use a loaded up Mac, not yet upgraded to Mojave OS. One thing that I have noticed a few times happens the using the Dodge/Burn actions in the V6 panel. An area that I paint will suddenly turn into a reddish or greenish tinted square. If I stop, turn the layer off and on again, it goes away. It may or may not happen when I resume painting. It doesn’t seem to affect the final image, but is annoying. I can send a screenshot if you’d like. Any info you may have would be great; I’ve not found anything on Adobe forums and I’m assuming it’s a bug in PS 2019. And also, thanks so much for creating the TK actions panel and the great support…I honestly don’t know what I would do without them and Sean Bagshaw’s superb tutorials. No one else has reported this, Brad, and I can’t replicate this on my MacBook air. I will say that by the time you start the painting process, Photoshop is completely controlling things. While the V6 panel can set up burning and dodging, it only creates the layers, brushes, and blend modes that make it easy. When you actually paint with the brush, the V6 isn’t doing anything at that point. The “square” you mention is really strange. Are you painting with a square brush? I doubt that you are, so it’s really odd that you get reddish or greenish tinted squares. This might be a good clue, but I just don’t know what it might mean. Also, the fact that you can correct this by turning the layer visibility of and back on is interesting. This suggests that Photoshop is having trouble creating the composite image after you paint. A few people have had a problem like this when their images have lots of layers. The on-screen composite doesn’t accurately reflect what the flattened image looks like. One way to test for this is to zoom into 100% magnification. This eliminates the compositing problem. So try zooming to 100% when you see this and see what happens. Are you painting on a image that already has lots of layers in the layer stack? If so, the compositing issue maybe be involved, but it’s hard to say. It’s normally associated with subtle brightness and contrast shifts, and not outright color tints. Also try flattening your image. Does that fix the problem? 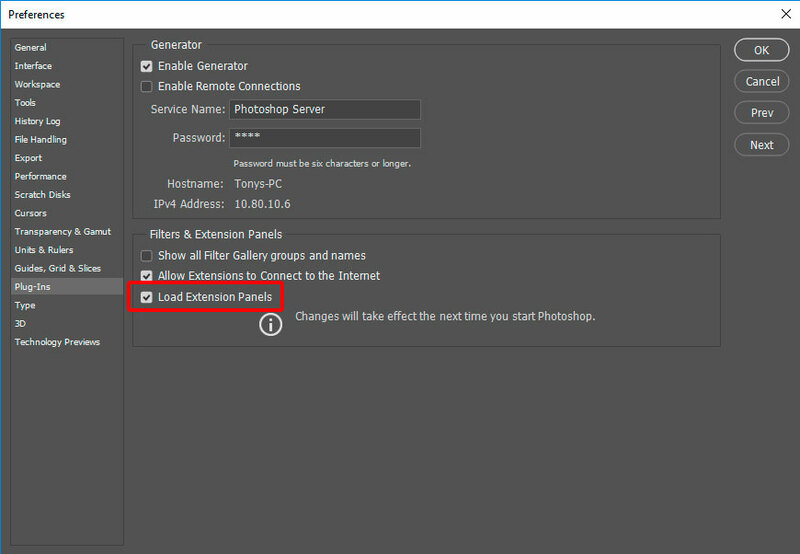 Photoshop doesn’t have to create a composite anymore once the image is flattened. If flattening fixes the problem, then creating an accurate composite might be an issue. If you can find a way to predictably replicate this, let me know. That’s really the key to understanding what’s going on and coming up with a solution. I h’vem seen this too a few times! Oh, that’s actually good to hear, Joerg. That means there may be some hope then of figuring out what’s going on. Are you on Mac or Windows? Do you use a mouse or stylus for painting? There’s a lot of variables we’ll need to test for. If you (or anyone) can reliably reproduce this, please let me know. I’ve been trying repeatedly to get the tinted squares on my Mac this morning using different types of layers and brushes and blending modes, but so far everything is still working fine. No tinted squares where I paint. I’m using a mouse for painting, not a stylus. Joerg–Do you find that turning the layer visibility on and off fixes the problem also? What about flattening the image? Does that also fix it? Any additional information would be helpful. If you want to Skype and demo this via screen share, that would be great. Just use the “Contact me” link on the right and we’ll get it set up. 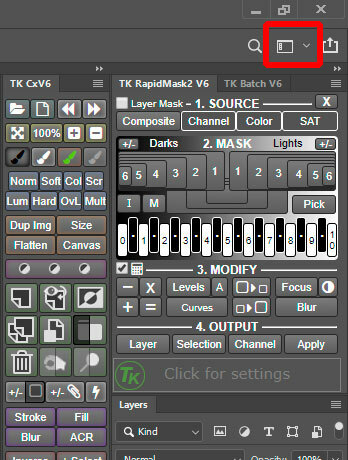 Ive found when I upgrade to the latest patch 20.0.1 photoshop it seems to break the TKActions panel masking capability, whilst the panels seem to load and remain visible, clicking on any of the masking functions does not execute any routines, and if I click on a Layer>Levels for instance i get the “Rapid Mask” required first message. Any ideas on how to best resolve? It actually sounds like everything was working properly, Adrien. That “Rapid Mask” required first message is one I programmed into the panel myself. It means you did not create a Rapid Mask before trying to use the output options in the “Layer” button menu. The “Layer” button menu options look for and uses the Rapid Mask to create at the layer mask on the layer that’s created. If there is no Rapid Mask channel for it to find and use, you’ll get that message. So what you’re describing sounds entirely normal if you’ve not created a Rapid Mask first. Next time you get that message, create a Rapid Mask first using the buttons in the SOURCE, MASK, and MODIFY sections of the RapidMask2 panel. Then try the “Layer” output option you want. It should now work with no error message. Hope that helps, but let me know if you have additional questions. 2. Open Photoshop CC directly from its launch icon on your computer. Do NOT open PS CC by opening an image from Lightroom, Bridge, or ACR. Have Photoshop CC open BEFORE opening any image. 3. Now open an image. 4. Try using the panel. The panel should now work normally and will demonstrate that this an Adobe problem and not an issue with the panel.